LegaSystems is a Microsoft Gold Partner, Microsoft Cloud Partner, Microsoft Certified Licensing and Services Provider. LegaSystems is an employee owned company — meaning that every employee is vested in the success of our customers. Our engineers are experts in the field, collectively we hold over 100 technology vendor certifications. Microsoft Office 365 ® Cloud Business Productivity suite with Premium Support and hosted monitoring — free trial for 30 days. What does our Office 365 for Enterprise Proposal Include? 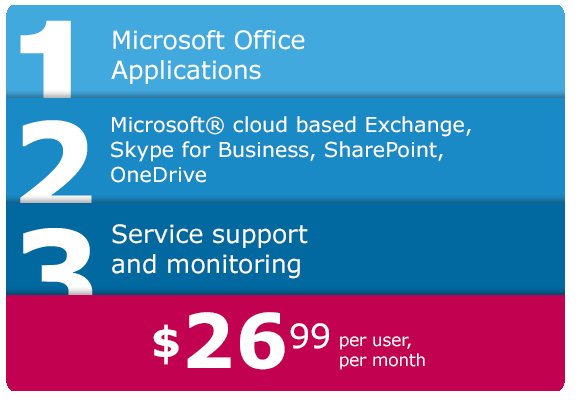 Microsoft Office 365 Enterprise E3 Subscription. Office 365 combines the familiar Microsoft Office desktop suite with cloud-based versions of Microsoft’s next-generation communications and collaboration services. LegaSystems Premium Support for Office 365. Premium Support Services for Office 365 designed to provide superior, ongoing support for Office 365 environment. System Center Operations Manager Monitoring for Office 365. Monitoring services that go far beyond traditional monitoring services with in-depth health checks, analysis and trending to proactively identify issues requiring remediation. The Service that we Offer, what problems does it solve? Eliminate high capital expenditures on hardware and software, electricity, maintenance and support. Reduce administrative overhead: eliminate time spent on updating, patching and planned downtime. Eliminate the need to upgrade and replace server infrastructure. What are the Main o365 Features and Benefits? Business-class email Large, 50GB mailboxes that can send messages up to 25MB in size, with contacts, shared calendars, and spam and malware protection that stays up to date. Built with Exchange email technology, the leading email solution for business around the world. Technical support Premium Support Services for Office 365 are designed to provide superior, ongoing support for your Office 365 environment. Team of dedicated, expert administrators, developers and engineers complement your resources, reduce the ongoing administrative burden and maximize your Office 365 investment with a predictable monthly operating expense. Comprehensive Monitoring Resolve issues as they occur rather than waiting for users and business stakeholders to report them. Our services go far beyond traditional monitoring services with in-depth health checks, analysis and trending to proactively identify issues requiring remediation. Get work done from anywhere Wherever your people are, online or offline, they can get to — and work with — the most up-to-date versions of the files and tools they need to get things done, and on virtually any device. Work better together — simply Office 365 offers business-class email, shared calendars, IM, web conferencing, and access to the most up-to-date documents stored in the cloud. You can work together in real time without compromising security. What is the Value to your Business?